33' to Alaska: Ready Set Sail...Almost. It's Sunday night, the night before we set sail. It never seems as we're actually ready but at some point, you've just got to untie and go. Tonight, Connor and I mostly finished packing the boat with fishing gear, downriggers, crab and shrimp traps, etc. while Val cracked enough crab for her magical recipes on board. It was a good day: church this morning, lunch at the ferry landing, compiled all my paper charts and made sure my Garmin was up to date, then we pulled crab and shrimp pots this afternoon. We had 8 big males in one crab pot and 56 shrimp in the shrimp pot (although, they're the little ones like little bay shrimp, not the big ones we get up north.) 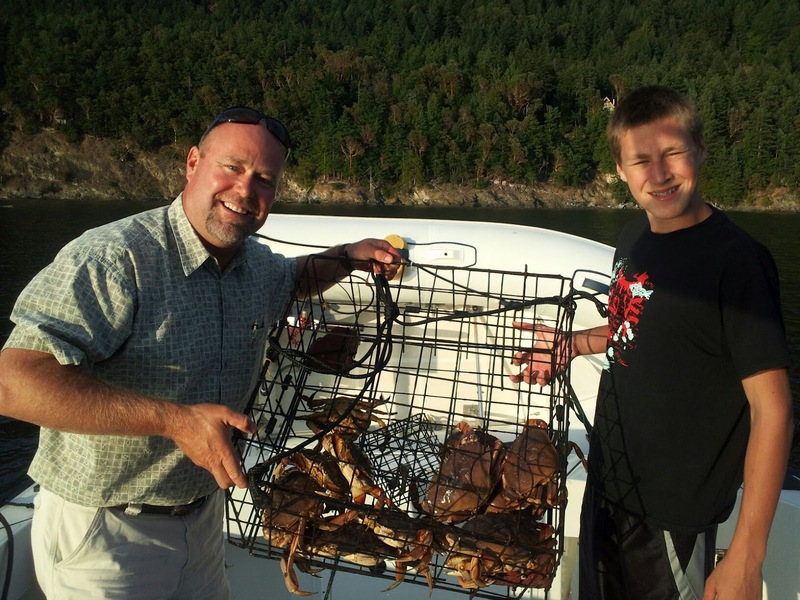 We have the best crabbing in all of the inside passage within 2 miles of our cabin here on Orcas. "Perhaps no stretch of Canada's Pacific coastline offers more challenges and thrills per nautical mile than the outer coast of Vancouver Island. Here, ocean swells, swiflty changing weather and strong winds, fog, and rock-studded shorelines test mariners' skills and self-reliance. But the rewards include myriad uncrowded anchorages, almost endless possibilities for getting "lost" in a place of one's own, and a sense of accomplshment big enough to last a lifetime." It continues, "Weather on the west coast of Vancouver Island differs significantly from the more moderate conditions of the Inside Passage and lower coastal mainland. The weather is a fundamental factor to be considered of a voyage along this exposed coastline. One major difference is the speed of changes in weather - monitoring forecasts and condition reports regularly between scheduled forecast time is essential in transiting safely to a protected anchorage when bad weather prevails." I am expecting to put on about 1,200-1,400 miles on the boat, which may not sound like much for you land lubbers but it is a significant trip on a 33' boat with a teenager and two labs. Cody, our oldest son is back home in South Dakota working and in his Junior year at the university. Well, as I sit here typing, I realize all the things that I forgot to pack and I see the pile by the door growing from Val and Connor's efforts. I guess, we're not quite ready....but we're leaving tomorrow!